A light, refreshing and easy pasta salad, perfect for summer picnics and outings. This lemon basil pasta salad recipe is always a crowd pleaser! Whisk lemon juice, olive oil, mustard and minced garlic. Drain bow tie pasta and rinse with cold water. 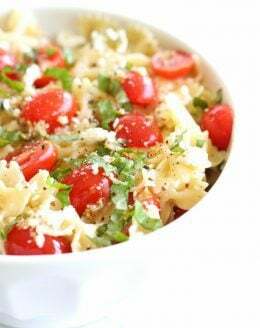 Toss drained pasta with dressing, feta, cherry tomatoes and basil. Refrigerate until serving (recommend 2+ hours to allow the pasta salad dressing to marinate the bowtie pasta). This recipe calls for bow tie pasta, but you can choose the noodle of your choice. Prepare al dente for the best results.